The son of a teamster, Hugh Sawrey was born at Forest Glen near Buderim in Queensland on the 3 March, 1923. 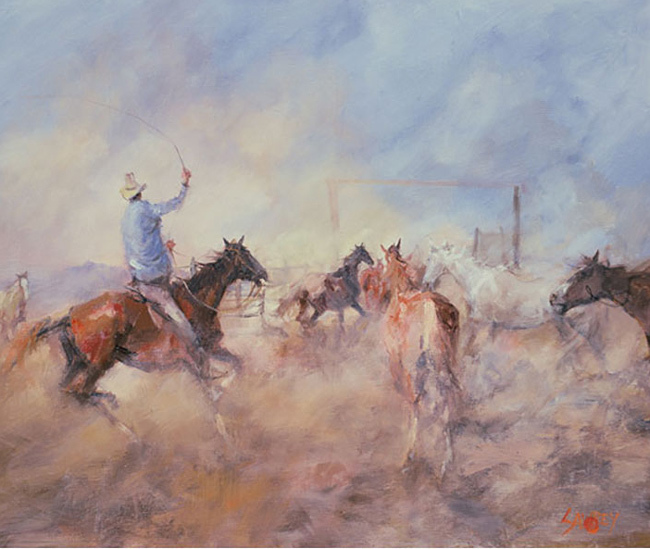 As a young boy, Hugh was fascinated by the folklore of the outback, filled with the exploits of rugged cattlemen, their horsemanship and their epic droving feats. 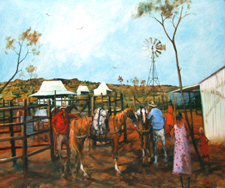 Hugh is renowned as a figurative impressionist painter of the outback. 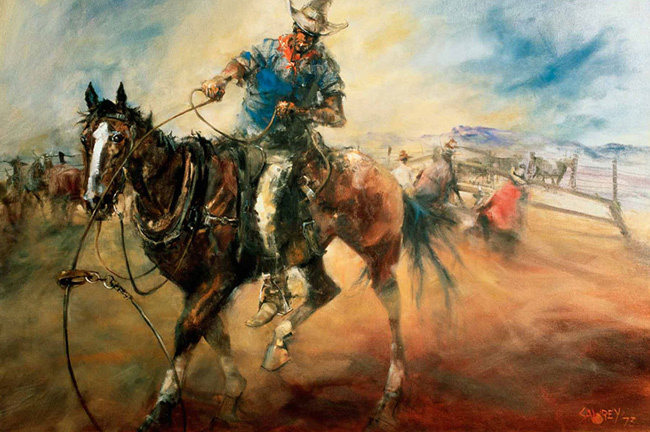 He is arguably Australia’s greatest bush painter and undoubtedly one of the best painters of horses in the world. 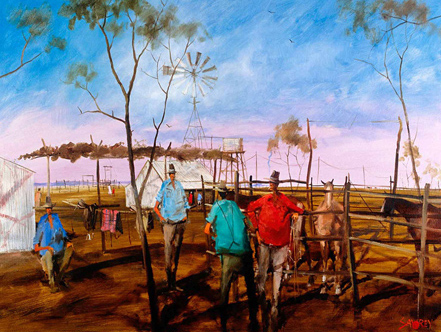 Vibrant images of horses and cattle, the dust of the outback and station life are images synonymous to Hugh Sawrey. In addition to his skill as a painter, Hugh Sawrey is also highly regarded as a writer and poet and illustrated four books. Hugh Sawrey’s love of the Australian bush stems from his childhood. His father died when Hugh was only three years old and Hugh moved from Forest Glen with his mother and brother to live in Brisbane. After one year of secondary schooling, Sawrey took to the bush when he was 14 and began working, sending money back to assist his mother during the bleak days after the Great Depression. 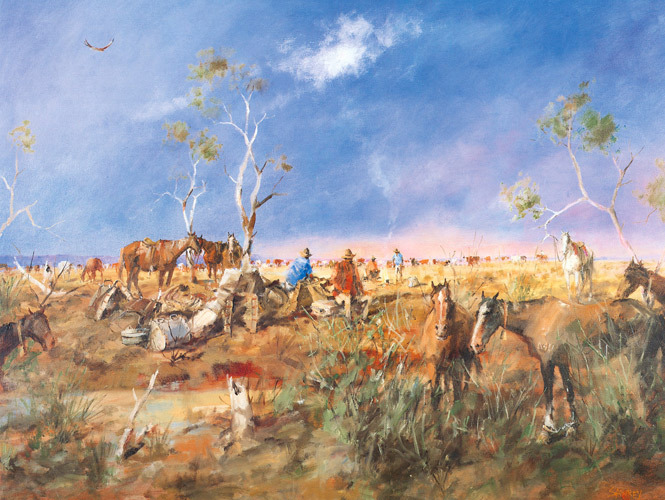 Hugh Sawrey was no stranger to the hardship of the Australian outback. He became an expert horseman and all-round bushman when working as a head drover, rabbiter, axeman and shearer. Sawrey travelled extensively throughout the interior of Queensland and the Northern Territory, often befriending Aborigines and occasionally being rewarded with access to remote tribal sacred places. 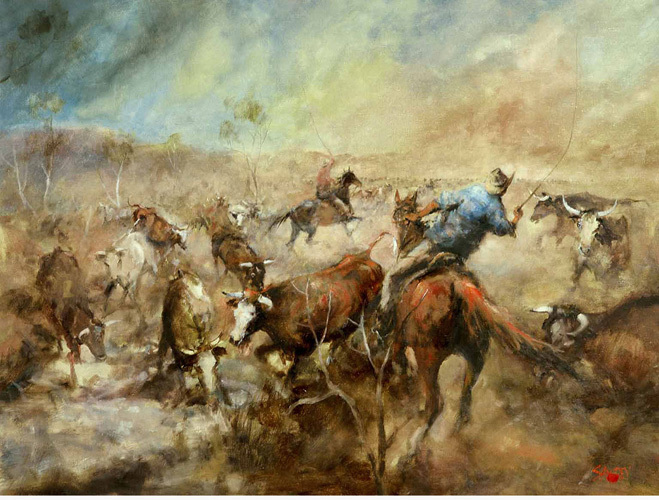 Many of his paintings of aboriginal stock boys and cattle mustering were inspired by his travels from Alexandria Downs in the Northern Territory to Tiberoo Station, out from Eulo. 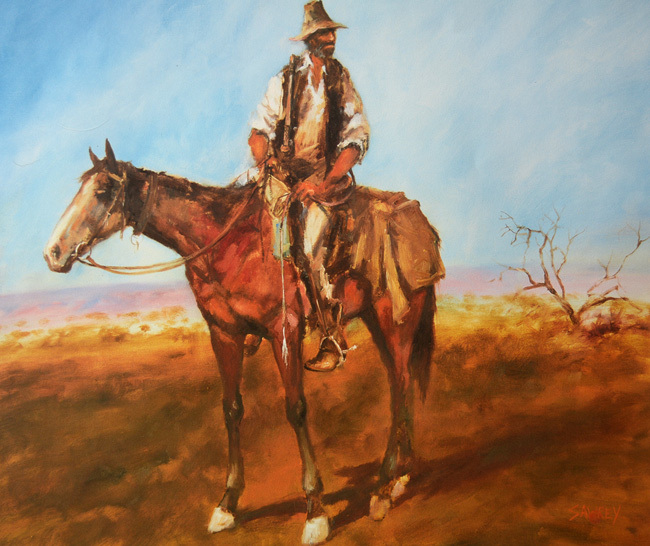 His droving experiences took him mustering out past the Cooper and Diamantina, and as far west as Western Australia. In his impressionable years as a stockman and developing artist, Sawrey mustered cattle on many of the runs known to Kidman and his men. 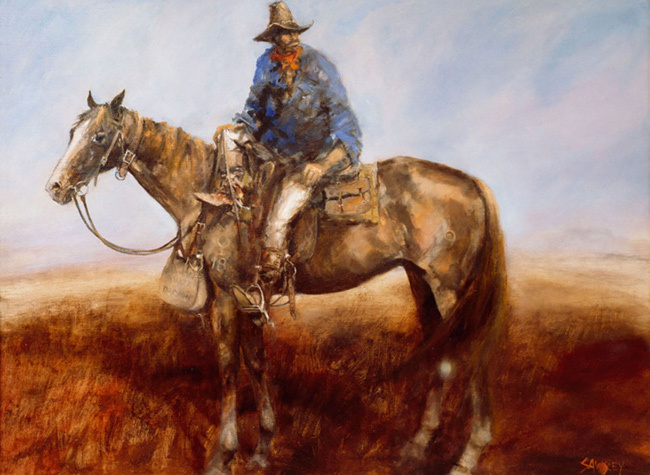 Everywhere he went, he carried scraps of paper in his saddle bag to sketch the life around him and he began to paint all the facets of life he knew as a stockman. Ever present was his desire was to show town’s people what went on beyond the city lights. 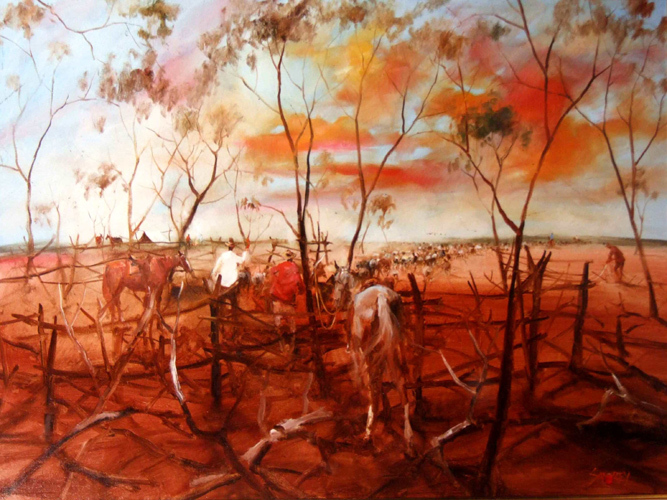 Sawrey said: “In my paintings and drawings I have tried to be honest and factual above all things because Australia is an honest land.” A lifetime of outback stories are related by Sawrey in his works which are a valuable narrative about life on the land in Australia. 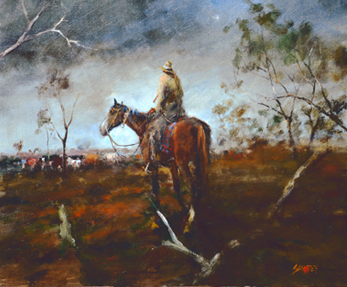 Sawrey has exhibited widely throughout Australia and in 1979 was selected as one of two Australian artists to represent Australia in “The Horses of the World” exhibition in London. 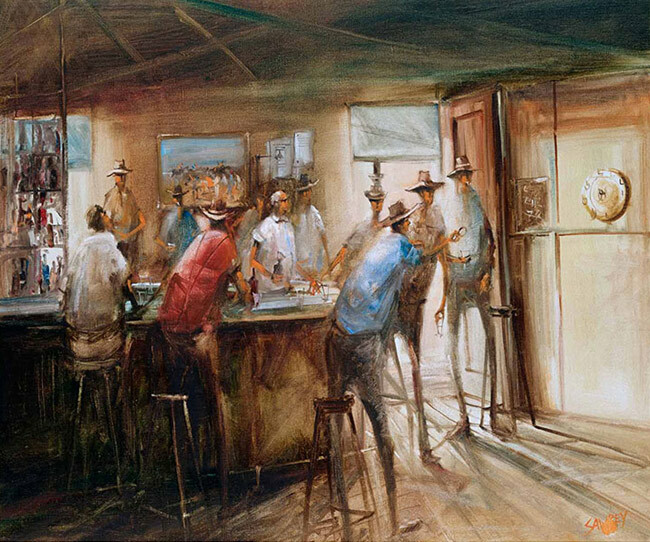 Sawrey was also a founder and former chairman of the famous Australian Stockman’s Hall of Fame at Longreach – home to a magnificent self-portrait by Sawrey which was donated to the Hall of Fame. 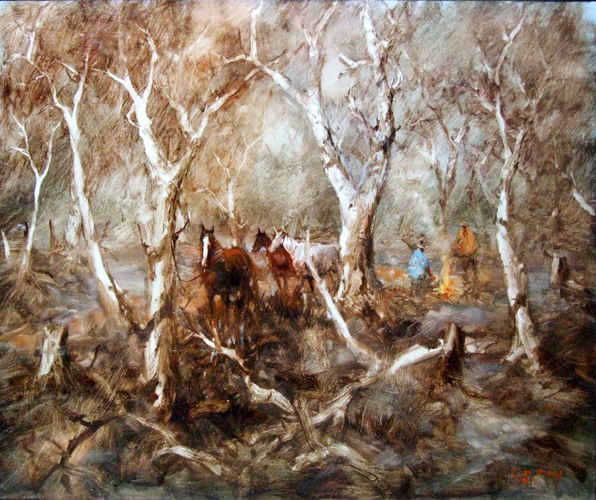 Hugh Sawrey exhibited in most of Australia’s major galleries and also in London at the Tryon Gallery. His work is represented in important public and private collections including the following collections in Australia: the Queensland Art Gallery, the Robert Holmes a’ Court Collection, the Sir Rupert & Lady Clarke Collection, the Lady Fairfax Collection and the Robert Nesen Collection. 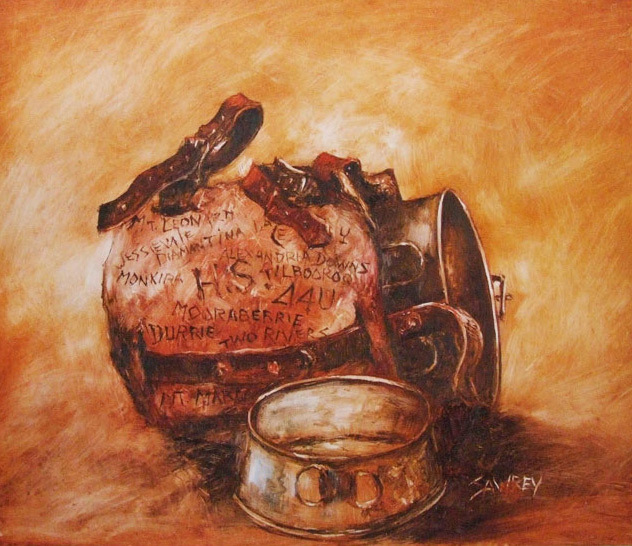 Hugh Sawrey limited edition etchings, giclee prints and silkscreen works at Etching House Melbourne Fine Art affordable art fair May 2012.